What Are OM1, OM2, OM3 and OM4 Fiber Patch Cable? Fiber optic cable can be divided into several types. Usually we see single-mode and multimode fiber types available on the market. Multimode fibers are described by their core and cladding diameters. The diameter of the multi-mode fiber is either 50/125 µm or 62.5/125 µm. At present, there are four commonly used OM (multimode) fibers: OM1, OM2, OM3 and OM4. Each type of them has different characteristics. Each “OM” has a minimum Modal Bandwidth (MBW) requirement. OM1, OM2, and OM3 are determined by the ISO 11801 standard, which is based on the modal bandwidth of the multi-mode fiber. In August of 2009, TIA/EIA approved and released 492AAAD, which defines the performance criteria for OM4. While they developed the original “OM” designations, IEC has not yet released an approved equivalent standard that will eventually be documented as fiber type A1a.3 in IEC 60793-2-10. OM3 has a suggested jacket color of aqua. Like OM2, its core size is 50µm. OM3 supports 10 Gigabit Ethernet at lengths up to 300 meters. Besides OM3 is able to support 40 Gigabit and 100 Gigabit Ethernet up to 100 meters. 10 Gigabit Ethernet is its most common use. Why Are OM3 & OM4 Fiber Superior to OM1 & OM2? Both OM1 and OM2 work with LED based equipment that can send hundreds of modes of light down the cable, while OM3 and OM4 fiber are optimized for laser (eg. VCSEL) based equipment that uses fewer modes of light. LEDs can not be turned on/off fast enough to support higher bandwidth applications, while VCSELs are capable of modulation over 10 Gbit/s and are used in many high speed networks. For this reason, OM3 and OM4 are the multimode fibers included in the 40G and 100G Ethernet standard. 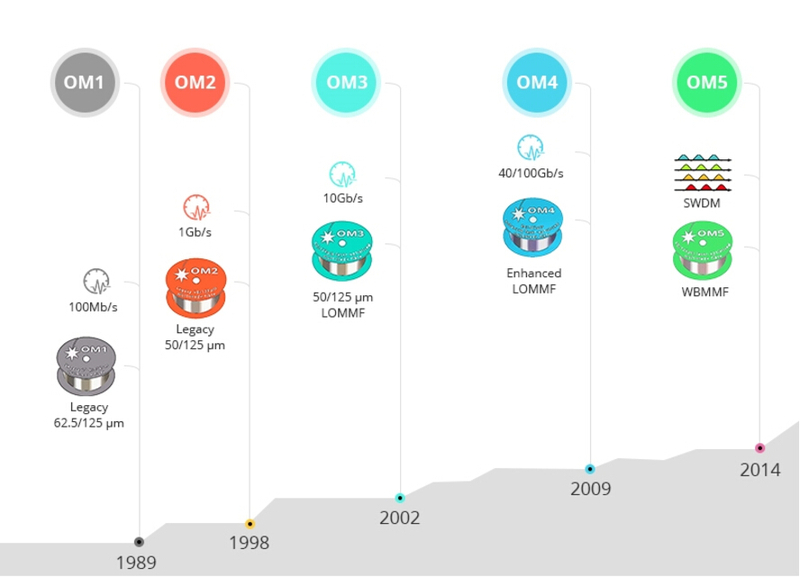 Now OM1 and OM2 are usually used for 1G which are not suitable for today’s higher-speed networks. OM3 and OM4 are used for 10G mostly at present. But in the future, since OM3 and OM4 can support the 40G and 100G, which may make them the tendency. OM5 multimode fiber, as the advanced version of the old OM4 fiber, is thought to be the future of multimode cabling. It is the Wideband multimode fiber (WBMMF) that can support wavelengths between 850nm and 953nm. It is also designed to support the short wavelength division multiplexing (SWDM)—one of the new technology for 40G/100G connection. However, will it be the ideal transmission medium for 40GbE/100GbE cabling solution? 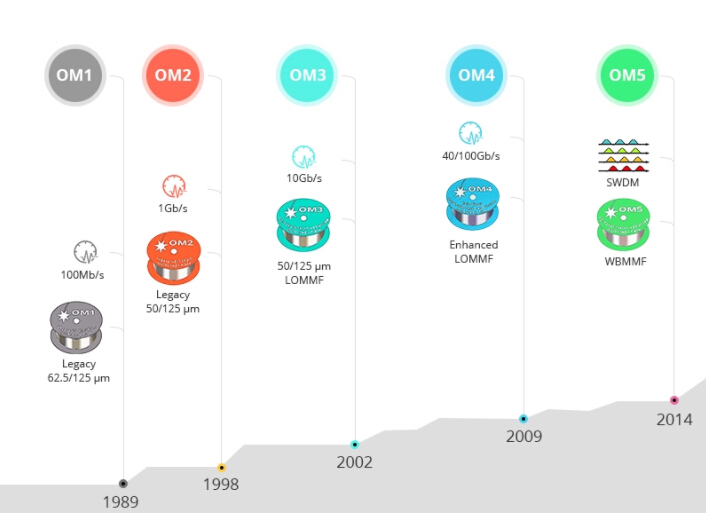 Over the past thirty years, multimode fiber has been evolved from OM1 to OM5 multimode fiber. OM1 and OM2 fiber, released at the end of 20th century, are the legacy 125µm multimode fiber that are working fine in 10Mb/s, 100Mb/s and 1000Mb/s cabling solution. However, with the high speed data rate like 10Gb/s, 40Gb/s, 100Gb/s and beyond coming into our life, multimode cabling (OM1 and OM2 ) with LEDs can not meet the requirement. The laser-optimized OM3 and OM4 has been developed subsequently. 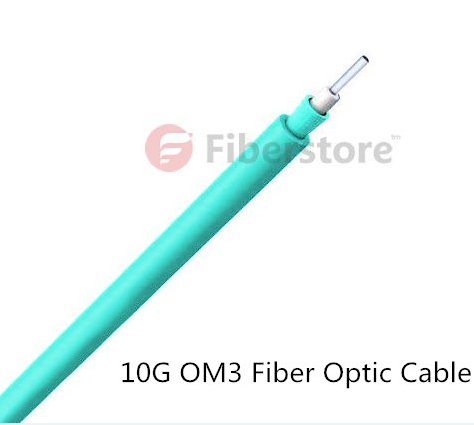 OM4 fiber cable, with the internal construction, possess higher modal bandwidth than OM3 fiber, which is commonly used fiber medium for 40G/100G connection. But there is a problem. In a 40G layout, fiber optic technicians have to use one MTP fiber and 4 OM4 duplex fibers (total 8 fibers), which is obvious not preferable for high-density cabling networks. So here comes the OM5 fiber. By utilizing SWDM technology, it can greatly reduce fiber count into 2 fibers (4×10G) in 40G networks, 2 fibers (4×25G) in 100G links. OM5 is the lime green multimode fiber, displayed as follows. 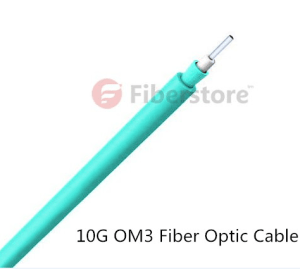 Reduce fiber count for 40G/100G connection—OM5 fiber as the advanced version of OM3/OM4 fiber, is backward compatible with OM3 and OM4 fiber cabling. And with the SWDM technology, this fiber can only use two OM5 fibers and 40/100G SWDM4 transceivers in 40G and 100G SWDM4 cabling. Longer-transmission distance—OM5 is designed and specified to support at least four WDM channels at a minimum speed of 28Gbps per channel through the 850-953 window. Compared to OM4 fiber cable, it is specified only to work at the 850 nm window. OM5 multimode fiber delivers higher value to network owners for distances up to 440m (for data rates up to 40Gbps), and allows for smooth migration to 400Gbps for distances up to 150m. While OM4 fiber cover the distance of 350m, 100m over 40G/100G respectively. Easy management & installation—in 40G/100G network, multimode connectivity together with MTP/MPO systems makes for a more user-friendly solution for data centers as well as building and campus backbones, especially in cable installation, troubleshooting, cleaning, and overall maintenance. FS offer Lime green OM5 fibers. All our OM5 fiber cables are guaranteed by End Face Geometry Test, Continuity Test, and 3D interferometry Test to be high quality. Available in LC, SC, FC, ST, etc. 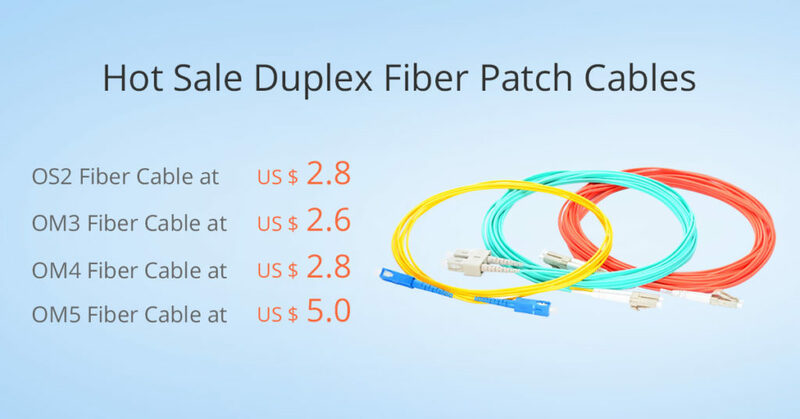 Connectors, and the cable length of OM5 fiber can be provided from less than 1 meter to more than 100 meters, which will well meet the needs for 400m transmission of 40G SWDM4 QSFP+ module and 100m transmission of 100G SWDM4 QSFP28 module, as well as the links on the same rack or row. Not only the OM1/OM2/OM3/OM4/OM5 multimode fibers are provided at FS.COM, but fiber optic cables like singlemode fibers (OS1/OS2) , Twinax copper cables are also offered. For more information about the cost-effective fiber patch cables, Please feel free to contact us via http://www.fs.com.